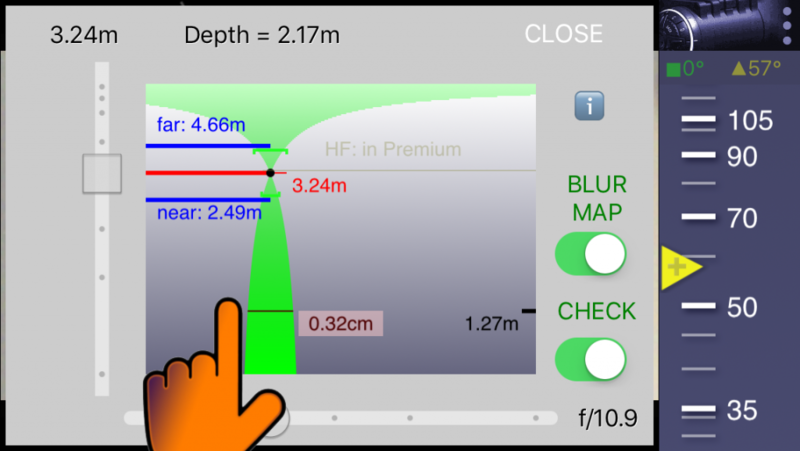 DOC Calculator Tool in Magic ViewFinder apps is quite innovative yet extremely simple to use. 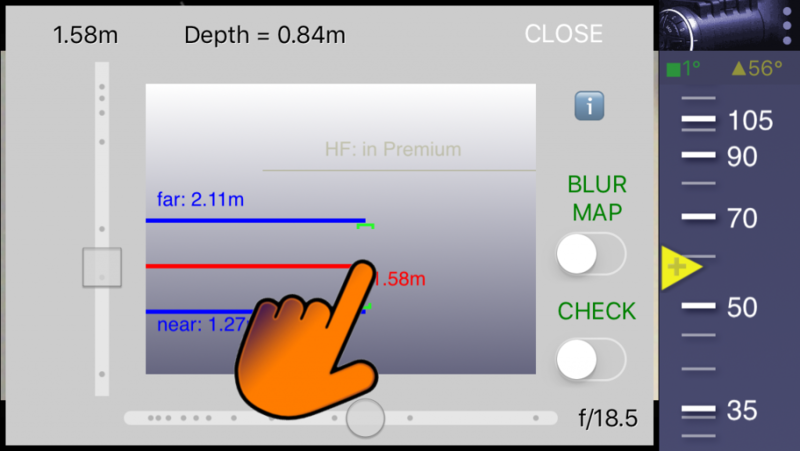 You can set the values for focusing distance (the red line) and the apertures by moving the sliders. Accordingly you can see the near and far limits of the sharp area (the blue lines) — the Depth-of-Field. The DOF doesn’t depend on the camera or the sensor you are using. That is why you should also adjust the focal length of the lens (the dark blue wheel on the right). 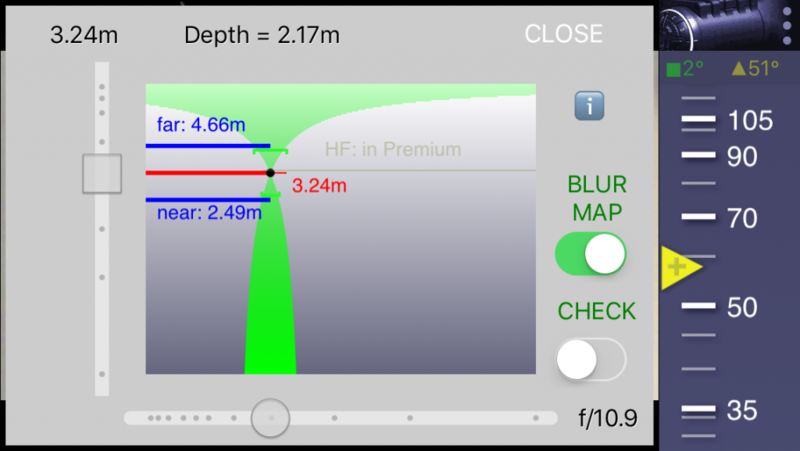 You can also see the Hyperfocal Distance value only if you have purchased Premium Features. NOTE: though the lines for the near and far limits of the DOF (the blue lines) seem to be equally away from the focus mark (red line) the actual distances are not equal (the vertical axis for the focusing distance is not linear). The green area shows the size of the minimal sharp detail at any distance up to the infinity. The wider the green area is, the larger is the amount of the non-sharpness. In other words, anything smaller than that size will be totally blurred (sometimes this size is called the Disc of Confusion). As you can see the blurriness decreases as you approach the focus point, where it turns zero, and then it grows as it approaches the infinity. Now by tapping the green area you can read the exact size of the Disc of Confusion. One example from the picture above: let’s assume that you have a paper with a word written on it. The letters written on that paper are 3mm tall. 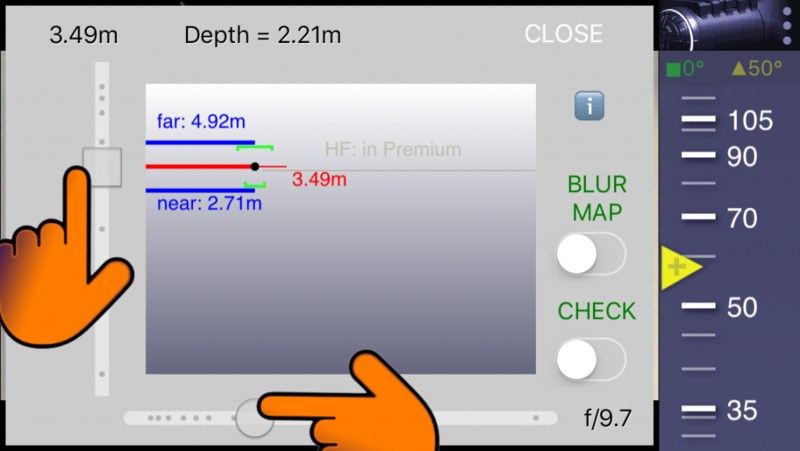 If your lens is set at the focal length of 58mm (the blue wheel on the right) and is focused at the distance of 3.24m (the red line) then if you place the paper at the distance of 1.27m from the camera (provided the aperture is f/10.9), the word on the paper will be blurred so that it can be hardly discerned. How do we know that? From the screen above the minimal sharp object at the distance of 1.27m is 3.2mm. Anything less will not be sharp.